Saturday 6 September was flying day at the Aeroprakt factory and club airfield. Doug King and I were lucky enough to spend a fair bit of time flying in the Foxbat (both A22L2 and A22LS versions) as well as having a good look at other aircraft around the airfield and in the hangar. The photo here has not been photo-shopped to look like this. It was taken with a a small Sony camera, similar to a GoPro, mounted on an extendable pole, held just outside the (removed) left hand door of a Foxbat. Apart from yours truly, the pilot is senior instructor Nadia from the Aeroprakt Club. Yuriy Yakovlyev was flying the other aircraft with Doug King. The reflection of the wing and the aircraft are all exactly as per the original shot – sometimes you just get lucky. Talking of which, a young photographer at the airfield managed the shot of a lifetime – using a huge telephoto lens, he captured a silhouette of a Foxbat against the almost-full evening moon. I’m hoping to get a copy and put it on here – it really is a shot of a lifetime. There are some other photos of the flying day here on the Foxbat Pilot Flickr Album. Tomorrow, sadly, I am leaving the Ukraine to begin my eventual way home to Melbourne. Thank you everyone at Aeroprakt for making Doug and my visit so enjoyable and memorable. 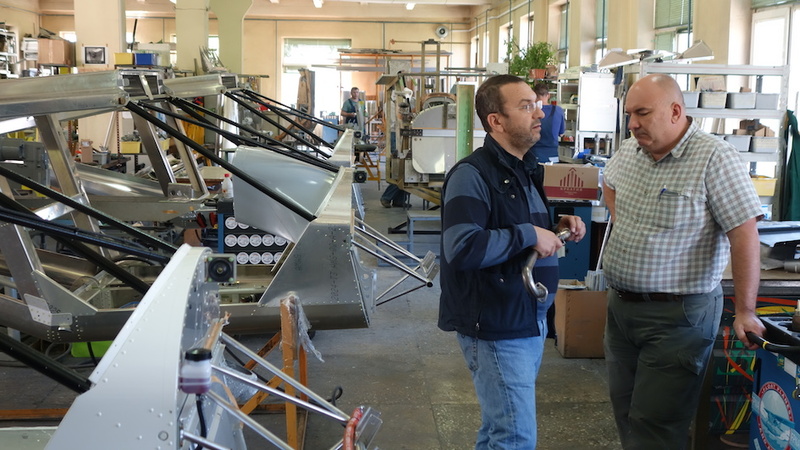 Friday 5 September was taken up with a visit to the centre of Kiev, as well as a tour round the factory, a visit to the Aeroprakt airfield, just outside Kiev, and of course business discussions, questions and answers. Our host was Alexei Zhurba, one of the senior people at Aeroprakt, who speaks excellent English. 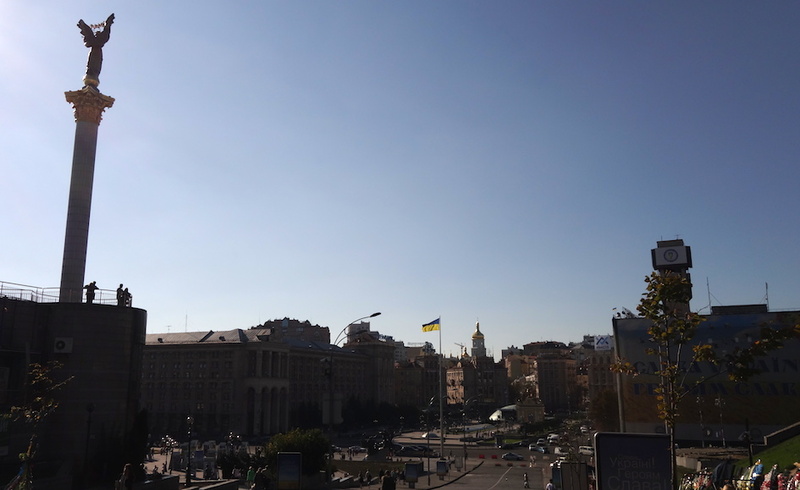 First though, Kiev is a beautiful city, made even more attractive by the late summer sunshine and 23-24 degree temperatures. There are tree lined streets and stunning architecture, much like many other European cities. We visited the ‘Maidan’, the square where all the unrest and fighting took place earlier this year. I found it almost impossible to imagine what happened here such a short while ago, although the seemingly endless memorial shrines to those who died are a shocking reminder. The city is now calm and the square has been largely cleared and repaired. All I can say is that those of us who have lived all our lives in the relative peace and security of Australia, and other westernised countries, are very lucky indeed. Onward to the Aeroprakt factory, where it is very much business as usual. We met with several people, including Yuriy Yakovlyev, the CEO and A22 designer, Oleg Litovchenko, his business partner, and Nina, the sales and distributor liaison person. I have posted some more factory pictures in the Foxbat Pilot Flickr photo album. Late in the afternoon we arrived at the airfield and were lucky enough to catch a few circuits in one of the Club A22LS aircraft, under the watchful eye of right-seat pilot Yuriy. There is much more to report, including the availability of the 912iS Sport engine in new A22LS aircraft, a retro-fit engine mount and cowling to enable earlier 912iS engines to be upgraded to the higher spec 912iS Sport for Foxbats already delivered, a potential external power supply socket, a different tyre & tube option, and much more. I’m aiming to cover as many of these as I can in future posts…so watch this space! Saturday, we are hoping to get in some more flying at the airfield and expect to meet some more Aeroprakt people in a more social setting. 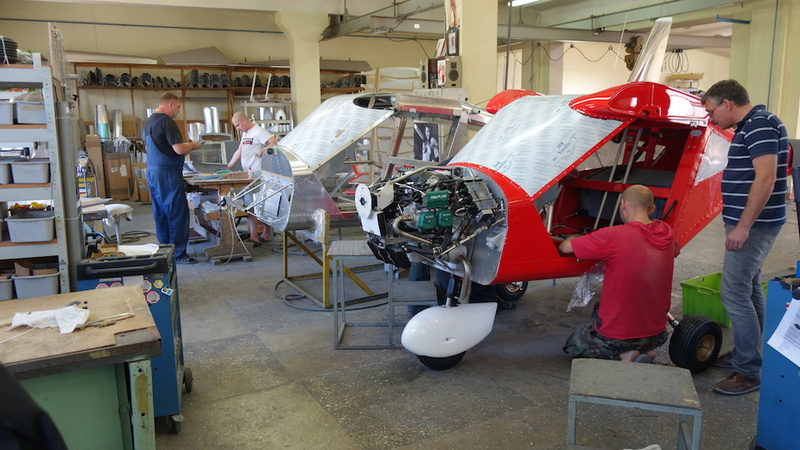 In spite of misinformed rumours to the contrary, I can confirm (again) that the Aeroprakt factory is operating as normal. Here are just a couple of pictures taken today. Currently there are around 5 A22L2 aircraft in production, and 4 A22LS, including a couple of A22LS orders I just placed for an owner in the Philippines.